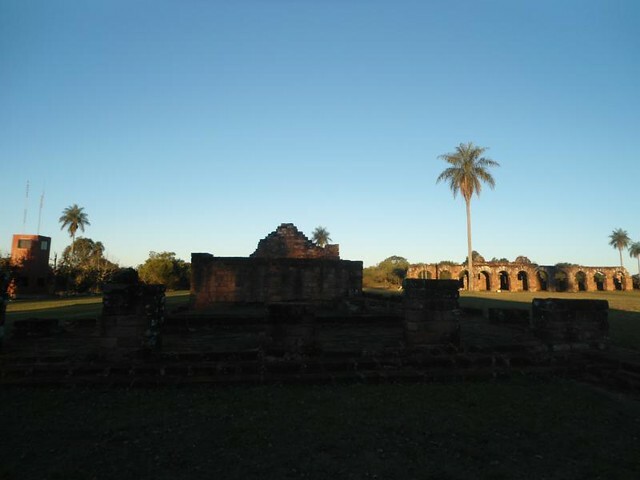 By the beginning of the 17th century, the Jesuit Province of Paraguay was created. It was a territory of approximately 490,000 km² made up of part of the current territories of Argentina, Paraguay, Brazil, Chile and Bolivia. 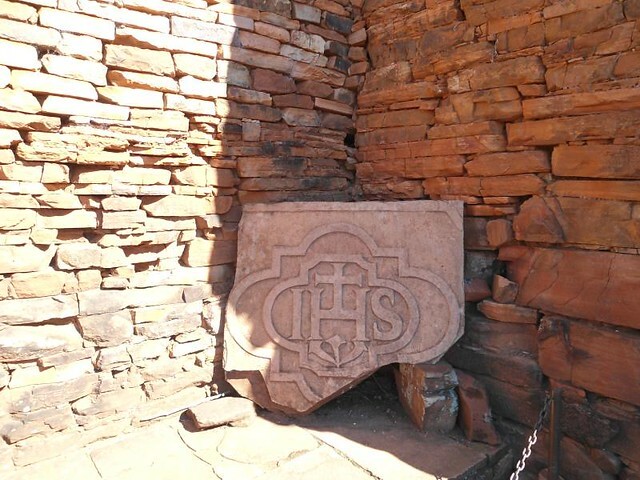 Thus began to be built in the area a series of reductions in which each had a temple, school, workshop and house of Indians where the Jesuits protected and educated native people in religious matters and in different trades. 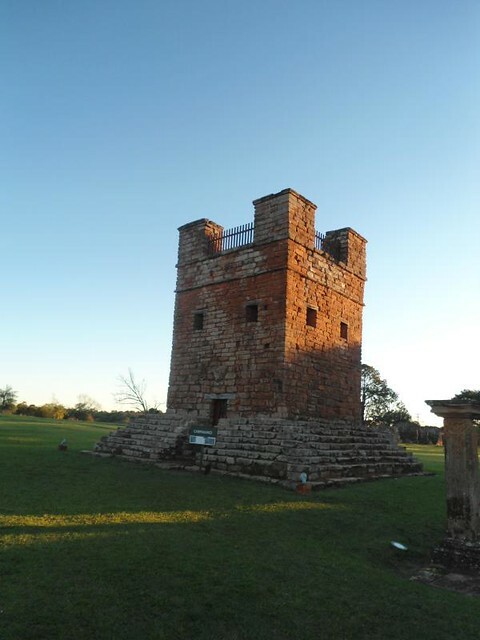 During the period from 1607 until the expulsion of the order in 1768 were built at least 80 reductions in the area of which nowadays are some ruins declared as world heritage by Unesco and which they are open to the public for visiting. Here I’m going to mention the ones that I have been in the Argentine (San Ignacio Miní) side and Paraguayan side(Santísima Trinidad del Paraná and Jesus de Taravangué). 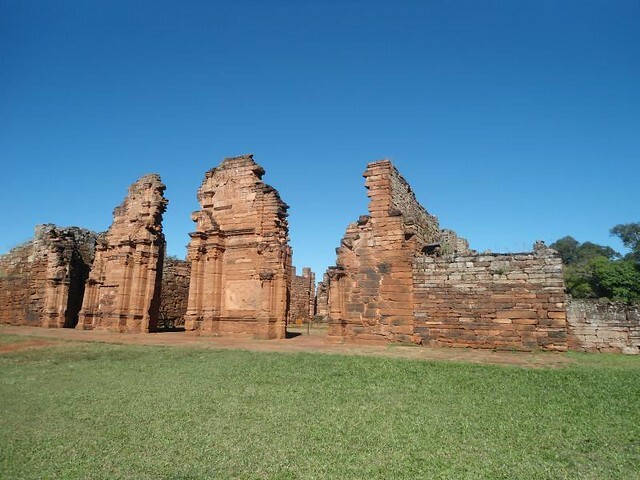 Located in the town of San Ignacio around 60kms from the city of Posadas in Argentina this Jesuit reduction is one of the best known and best promoted. 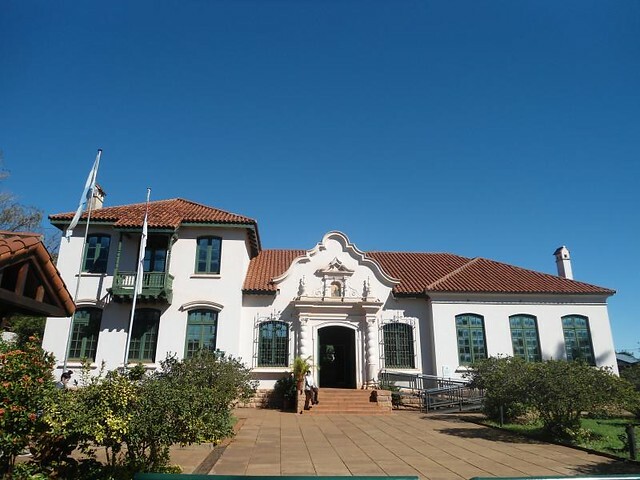 Established in the year 1632, it hosted up to 3,000 Guarani Indians who were educated in various trades within the reduction until the expulsion of the Jesuits in 1768. Subsequently, the reduction was destroyed and what can be seen today is a couple of baroque ruins of the period. 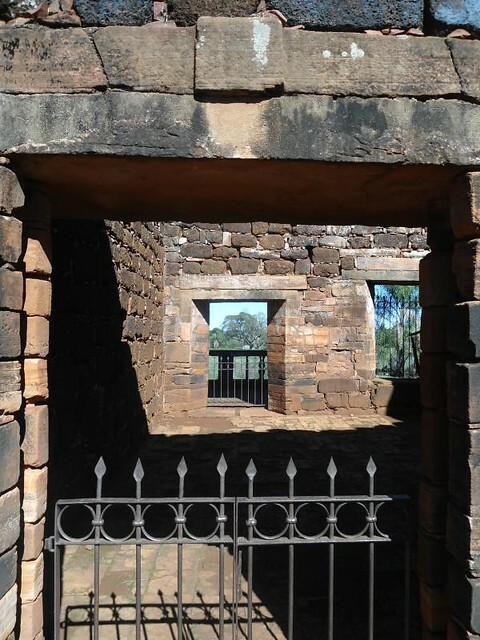 The visit to the ruins is by free or with a guide, previously paying an entrance fee; as the complex is not very big and the main attraction is the ruins of the church you can see all the complex in about an hour; the visit include also a small museum. The place can also be visited at night where there is a very interesting show of light and sounds. To get the town of San Ignacio, you can ride any bus from Posadas to Puerto Iguazú, in my case I used a bus of the company Río Uruguay from Puerto Iguazú. The trip is not too comfortable because the bus is usually full and there are standing people as well. Close to your destination you’ll need to let the driver know that you want to get off at the town of San Ignacio. For return to Posadas the trip takes approximately one hour. 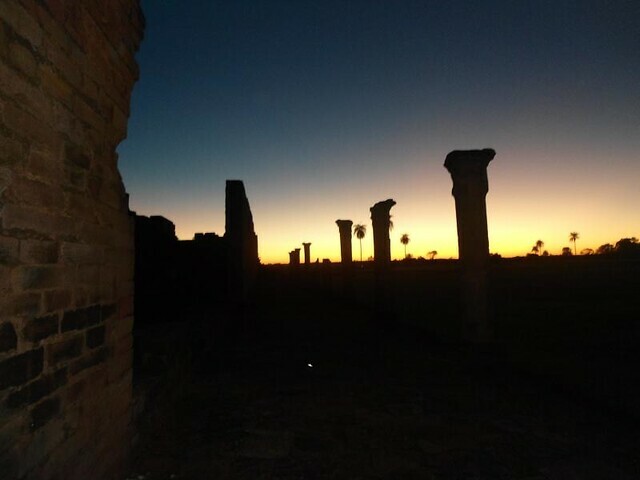 I arrived in the Paraguayan city of Encarnación from Posadas with an international bus and half day of time to visit the ruins. When crossing the border and carrying out the migratory procedures, the bus in which I had arrived was no longer there, but it was not a problem since in 15 minutes another one had arrived and took me directly to the Encarnación terminal. Once in the Encarnación terminal, the panorama was not very attractive; I found an old and dirty terminal in where nobody couldn’t sell me a ticket because I didn’t have local currency and changing money at the street is quite risky. 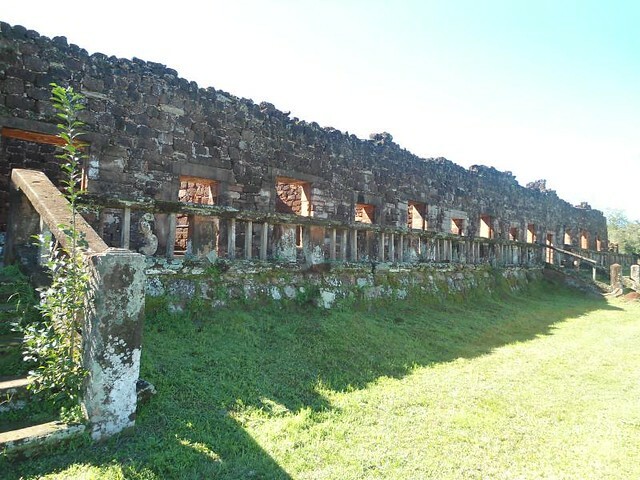 Luckily for me, next to the terminal I found a taxi stand where I convinced a taxi driver to take me as a tour guide to the Jesuit ruins of Santísima Trinidad del Paraná and Jesus de Taravangué. 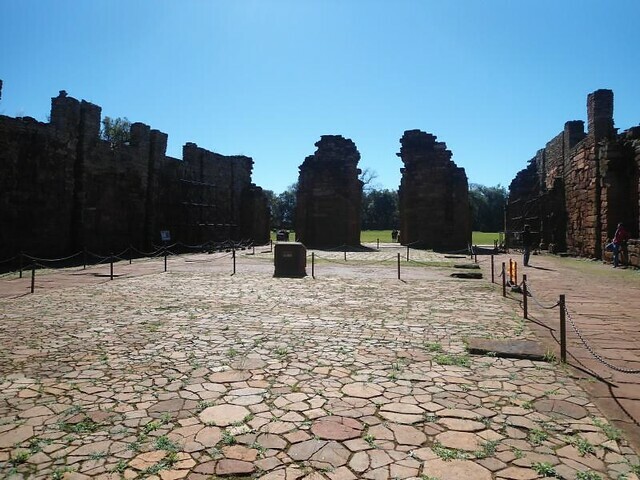 Founded between 1706 and 1712, the Jesuit mission of the Santisima Trinidad del Paraná, was declared as World Heritage Site by Unesco and is one of the largest and best preserved of its kind. Located about 28 km from the city of Encarnación on Route 6 makes it a little bit complicated to visit because there is a lack of transportation to the area but you can get there easily by taxi haggling the price previously. The route between Encarnación and the ruins is paved and is a mostly rural area with settlements of Asian and European immigrants. Inside the ruins you have to pay in cash with local currency (Guaranies) so if you come from Argentina it is a good idea to change money in the city of Posadas before crossing the border. If there is no other choice, you can change money at a service station in front of the complex. Although the complex is large and interesting, the visit takes around half an hour or little bit more. The bad news is that there are no signals with explanations or a good system of promote the heritage beyond propaganda leaflets. This issue makes the ruins are not as attractive as they should be. 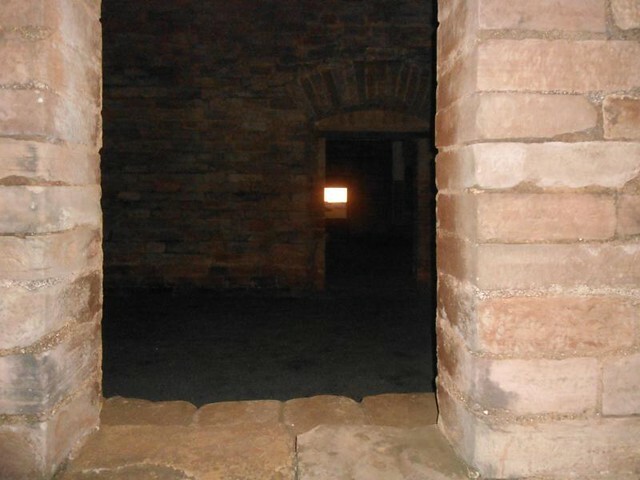 Additionally, if you have time to be there at nightfall you can see a show of lights and sound inside the complex. 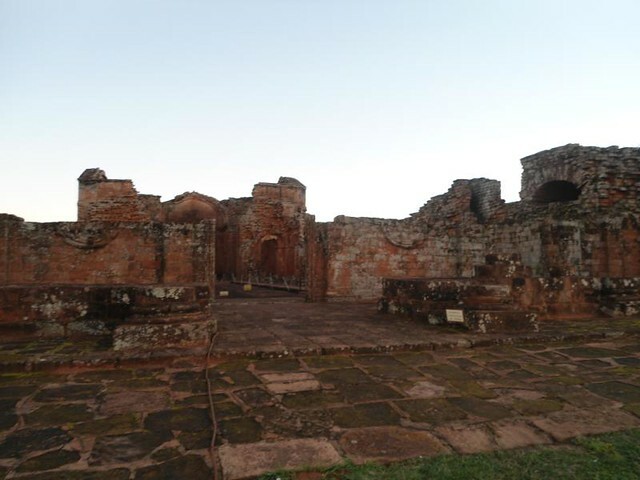 Founded in 1658 and declared as Unesco World Heritage Site, this complex is the second Jesuit reduction in importance after the Santísima Trinidad del Paraná. 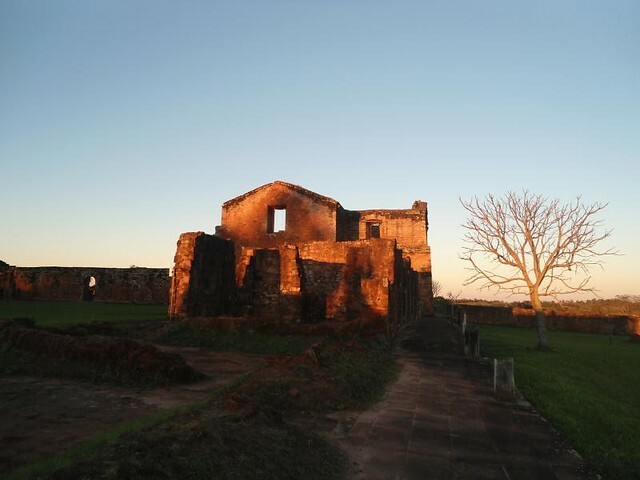 It is located about 11 kms from Santísima Trinidad del Paraná and the only form of access is by taxi from Trinidad. Another important fact to take into account to access the area is that not all streets are asphalt. The complex is small if you compared this to Trinidad but still has its attraction. Here there is a night show of light and sound like the other complex. Important: We can enter in Jesús of Taravangue with the Santísima Trinidad of Paraná ticket.